Gov. Peter Shumlin announced a slew of new cabinet and staff appointments Thursday, including the state's first secretary of education. That job goes to a familiar face: Armando Vilaseca, who has served as commissioner of education since 2009. Last year, at Shumlin's urging, the legislature elevated the state's top education job to a cabinet-level position, which is now subject to gubernatorial appointment. "I can't tell you how grateful I am to Armando not only for his past service but for his future service," Shumlin said at a press conference on the 5th floor of the Pavilion State Office Building. "We have an incredibly ambitious agenda coming up and his willingness to serve as the first secretary of education is going to be a great distinction for the state of Vermont." 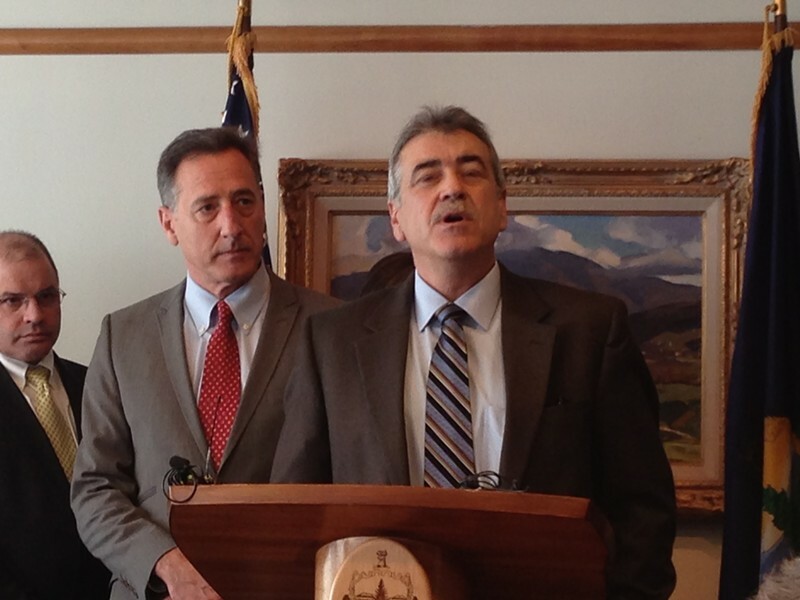 As Seven Days' Ken Picard wrote last August, Vilaseca (pictured above with Shumlin) was in the awkward position of essentially applying for his own job. He was one of three finalists for the position. Oddly, the appointment is for just one year. Shumlin said he'll begin yet another national search for a more permanent secretary this summer and hopes to make that appointment a year from now. "Like all of us in state government, including governors, I recognize that we ask commissioners and secretaries to work often seven days a week — sometimes six — long hours. We come in, we give it all we got, and then we tend to want to move on to new challenges. That's certainly the case with the secretary," Shumin explained. "This is really an arrangement and appointment that meets the secretary's goals, as well as ours." So does that mean Vilaseca didn't want a longer term? "Sec. Vilaseca made clear to me that he really wanted the job. He wanted to continue the great work he's doing, but it was on a limited timeline," Shumlin said. Asked if the temporary appointment made him a bit of a lame duck, Vilaseca said, "I consider myself a full secretary." He elaborated: "I think in the past few months, I think that there was some uncertainty. But now I think it's clear that as a secretary and the voice of the governor — we have almost identical views on education and the direction we should be moving in — so I think that it's a perfect choice for the position." Piped in Shumlin: "And I agree." Lucy Leriche — The former House Democratic majority leader from Hardwick was appointed deputy secretary of commerce and community development. Leriche resigned her House leadership position in May — though she retained her seat in the House through the end of her term — and took a contract with Green Mountain Power in June. She said her six-month contract with GMP as the utility's community relations point-person at the Kingdom Community Wind project in Lowell has been extended until the end of January, at which time she will formally move to state employ. Asked if he thought Leriche's appointment signaled that the revolving door between Green Mountain Power and state government was operating smoothly, Shumlin at first simply said, "No." He addressed the question again later: "I've worked with Lucy for many years. For a short time, she was an employee of Green Mountain Power, but she has many talents that are right for this job, and that's why I hired her." Sue Minter — Shumlin's Irene recovery officer for the past year will return to her old job as deputy secretary of transportation. Minter, a former state representative from Waterbury, was plucked from her Agency of Transportation job early last year to lead the state's response to Tropical Storm Irene. Minter will be replaced as recovery officer by her deputy, Dave Rapaport. Sue Allen — The governor's spokeswoman worked for years as a reporter and editor for the Barre-Montpelier Times Argus, the Burlington Free Press and the Associated Press. She also served as former governor Howard Dean's spokeswoman. Now she's getting a promotion: from special assistant to the governor to deputy chief of staff (that job opened up in November with the departure of Alex MacLean). But, unfortunately for Allen, she'll remain spokeswoman and, thus, will still have to deal with us reporters. Susan Bartlett — The former Lamoille County state senator and chairwoman of the Senate Appropriations Committee — not to mention one of Shumlin's four rivals for the Democratic gubernatorial nomination in 2010 — will transition from special assistant to the governor to special projects coordinator at the Agency of Human Services. Floyd Nease — Another former House Democratic majority leader, Nease was appointed director of systems integration at the Agency of Human Services. Most recently executive director of the Vermont Association for Mental Health and Addiction Recovery, Nease will attempt to coordinate state support for those who need it most. 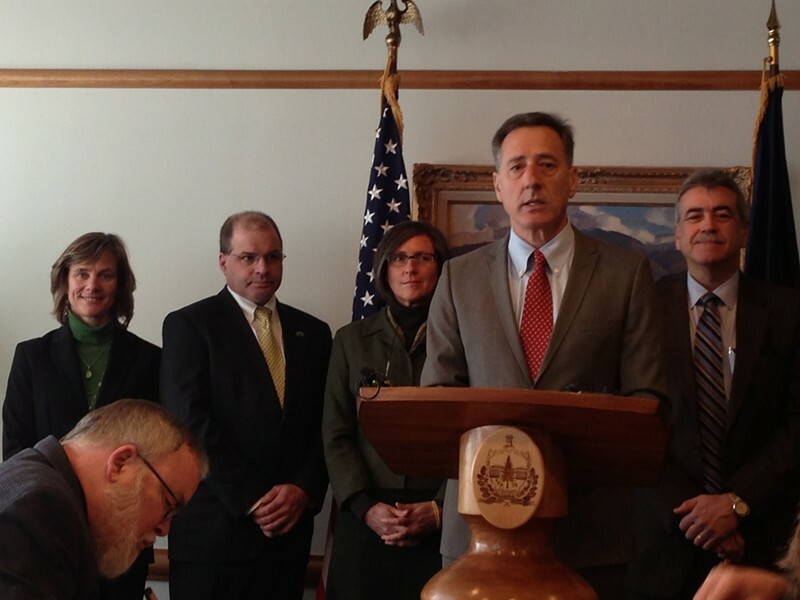 Pictured above from left to right: Minter, Secretary of Commerce Lawrence Miller, Leriche, Shumlin, Vilaseca.